The ogv.js media player shim used for Safari/IE/Edge supports WebM in current versions, but we haven't enabled it since a) the original deployment was Ogg-only and b) the Ogg Theora videos play back faster. In the short term, we're having trouble migrating ffmpeg2theora for Ogg Theora generation to the latest version of the base OS for the scalers (T145742)... and in the long term we'll need to drop Ogg to support adaptive streaming, so was already planning to deprecate it. brion added a subtask: T172445: Deprecate/remove Ogg Theora video output formats in favor of WebM. 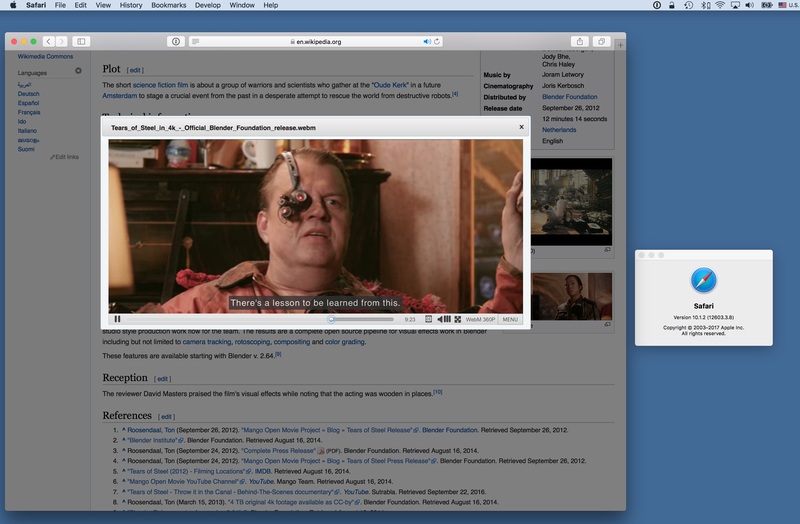 The WebM enabling is live on beta -- see for example https://simple.wikipedia.beta.wmflabs.org/wiki/File:Tears_of_Steel_in_4k_-_Official_Blender_Foundation_release.webm which now plays back the 360p-fitting WebM in Safari and IE. Once confirmed live to the world can disable the generation. Jdforrester-WMF added a parent task: T172445: Deprecate/remove Ogg Theora video output formats in favor of WebM.